One of the things I’ve always found lacking with the various types of RSS feeds available from social services is the lack of differentiation between created and discovered content. So I don’t just want to differentiate between blogs, microblogs, comments, and likes–I want to group these into categories that then have their own feeds. It matters because the website is slowly morphing into what it will end up being, which is an interface to one’s lifestream. A lifestream is everything a person does–captured digitally–and then presented for others to consume. In the future you’re just going to subscribe to people–not to services they use, or any of those other types of specifics–just people. And within your interface to that person you’ll be able to select what you want to see of theirs, and how. One of the biggest differentiators in this breakdown is the difference between what that person created themselves, vs. what they found and liked. And these different types of content should be separated (or be ABLE to separated) within all interfaces to someone’s content. And if you think about that, it makes complete sense. Basically, everything you would want your friends to check out that you come across. In the future, you’ll be able to aggregate many of these “discovered” feeds together, for your favorite people, and you’ll assign weights to the peoples’ opinions which will prioritize the stuff you’re most likely to like based on how many of your friends recommended it, and what weight you give to each friend. Anyway, that “disovered content” feed on my site is what I’ve just enhanced. Rather than just having my Google Shared Items (which is cool, you understand) I am now posting from a Yahoo! 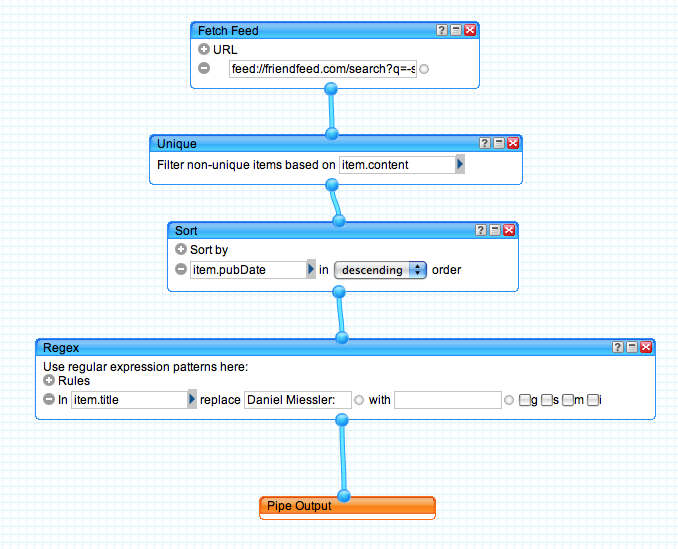 Pipe that pulls from the RSS feed of a Friendfeed search. So basically, if I think it’s cool, it’s going into that feed–and that feed is being pulled and displayed by your browser on every load of my site. That’s one of the primary functions that every website should have: showing what you find interesting and worthwhile. This is so important that it should be part of WordPress. It should also become a main feed of Friendfeed. And every other service that presents an interface to “you”. That’s my opinion, anyway, and I think others will agree once they’re shown the way.